This is my own recipe. You won’t find this bread outside of Sweden, unless you are on an SAS flight. Photo Copyright M-J de Mesterton 2008. Click image to enlarge. I devised this soup for a luncheon. It may be served cold or hot. mixture into a pot and heat it to simmering. Add a half-teaspoon of savoury, and a third-cup of crème fraîche or sour cream. Stir with a wire-whisk until the bits of cream are fully incorporated into the green soup. Heat again till just boiling, and serve. 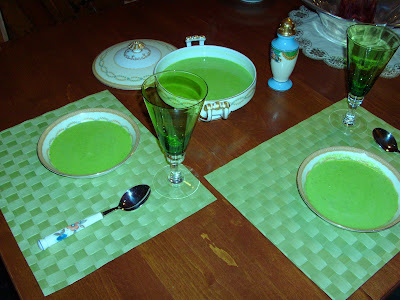 This recipe will make four bowls of Potage Printanier aux Petits Pois. Double the recipe by repeating the first step and adding the results to the pot, while doubling the other ingredients as well. Add salt according to your own preference. I use Himalayan salt. This soup may be served either hot or chilled. The cuisine of Provence, France, is one of the world’s most health-promoting, with its focus on fresh vegetables and use of olive oil. A very good table wine from the Vaucluse is Le Pigeoulet Vin de Pays. This wine is inexpensive, and complements French cooking. Argentinian red wine is excellent with beef. New York City has always had high-quality tap water, as do so many cities. I always use a low-cost Brita filter and pitcher at home, and don’t waste money on bottled water. Who knows the true provenance of that, anyway? After all, Evian is “naive” backwards!